It’s been a while since I posted, over a year in fact. I’ve been busy with a career, a family, and just plain life. On top of not having the time I have been lacking inspiration. Food is my life. I work with it everyday, sometimes to the point of not being interested. When I am not working, however, I love to cook and more importantly: EAT. 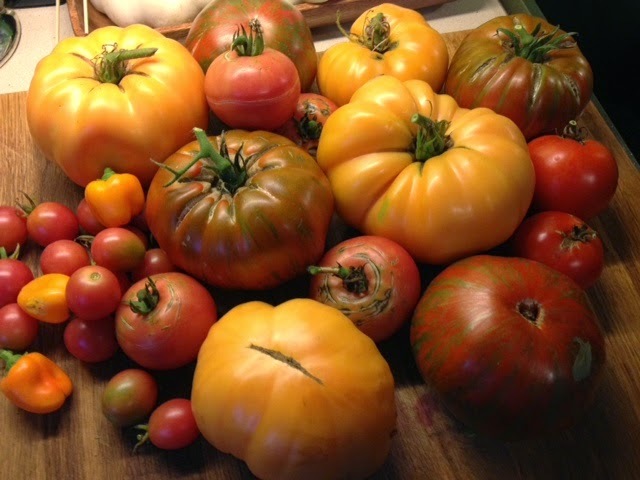 I found inspiration last week in the bounty of tomatoes my husband pulled from the garden. He had been bringing in a handful or two of cherry tomatoes every few days or so then one day he brought in the mother load. I had no idea what was going on in the back yard!!! He then left town for a week for work telling me that he wanted me to save him some for when he came back. A few have endured but most were getting past their prime. I shared a few with my family, I was throwing them in salads, making omelets stuffed with them and just cutting them up to eat with some salt and pepper at every meal. I still had too much for me to eat! I was trying to think of something fun to do with them. I could make sauce to freeze, I could make ketchup but then I remembered a truly memorable meal I had about a year ago at the Southern Food Ways Alliance Symposium in Oxford, Mississippi. Not only is it one of the most fun, food filled weekends of the year it brings to the forefront some fantastic chefs. Each year there is a focus on what the Symposium is about and last year was Women at Work. One of the meals was prepared by Chef Vivian Howard and was the one that sticks in my mind. She is the part owner of the restaurant The Chef and the Farmer with her husband in Eastern North Carolina. In that meal that she prepared there were two unbelievably delicious dishes. Simple, not fancy at all, just made with high quality ingredients and with so much care you could taste it. The two dishes she made that I can’t ever stop thinking about were her mother’s (Scarlett) Chicken and Rice and her Tomato Pie. I got online and began searching, not very hopeful that I would find the recipes but maybe a way to contact her directly to get them. Luckily in my search I discovered that she has a show on PBS called A Chef’s Life where she explores Southern food with a focus on farm to table. I began looking at the episodes and there they were out of the 13 episodes I found the Tomato Pie and the Chicken and Rice recipes. I quickly set to making both and although it never tastes the same as when someone else makes it for you they both were pretty darn close! Here are some pictures of the Tomato Pie and some links to the two recipes.